The foundation established by legendary special effects visionary Ray Harryhausen is pleased to announce a joint effort with Morningside Productions, the company of late film producer Charles Schneer. Discovery of new materials in the vast archives of the Ray and Diana Harryhausen Foundation will be the basis of a spectacularly new and original theatrical motion picture in the style of such Harryhausen/Schneer classics such as Clash of the Titans, the duo’s most significant box office collaboration from 1981. This project, tentatively entitled Force of the Trojans, is based on a screenplay by Beverley Cross, and original production art and sculptures conceived by Ray Harryhausen that are on par with some of his most iconic screen creatures. 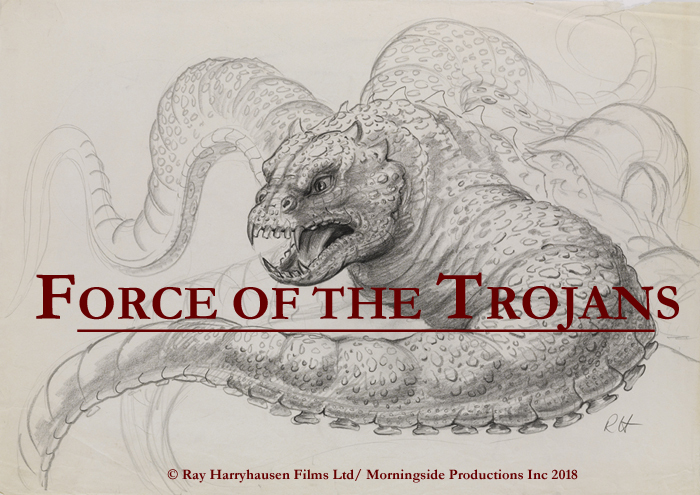 Force of the Trojans will embody the spirit of the original Harryhausen films with all the fun, vibrant action, epic scope and dedication to craftsmanship that has made Ray Harryhausen’s films timeless. This is a very exciting announcement! I grew up watching old tapes of Jason and the Argonauts and Sinbad and the Eye of the Tiger, and I cannot begin to describe how influential Ray Harryhausen has been to me. As a filmmaker early in my career, I hope one day to work with and advance the same techniques which Harryhausen pioneered. I am looking forward to more news from Force of the Trojans very soon. Great news for Harryhausen fans. that is good news to here. i grew up watching his films and they put you in another world..
i hope they do it right with the effects and the story. cgi is an effective tool for effects, but stop motion gives you the illusion that the character is alive. superheros are getting old. Its time for stop motion to make a comeback in fantasy story telling. After hearing that your unrealized film project, “Force of the Trojans” is going to become a vivid reality, I can hardly wait for you to share some exciting stuff with all of your fans. I’m getting tired of CGI shlock, and $50 million worth of Superheroes, dystopian future shock survival and giant CGI monsters destroying major cities. I want to see everything come back to life with physical effects just as the Jim Henson Company is doing with Netflix on “The Dark Crystal: The Age of Resistance”. I want to bring hands-on puppets, miniatures, stop motion animation and practical visual effects back to cinema. Thank you for your patronage, and I will be doing my picture storybooks based on your classic films.